The overwhelming majority of businesses in the U.S. are not C-corporations subject to the corporate tax. Rather, most businesses—about 95 percent—are “pass-throughs,” which have their income “pass through” to their owners to be taxed under the individual income tax. Pass-through businesses include sole proprietorships, partnerships, and S-corporations. Because these businesses’ decisions are affected by both corporate and individual tax systems, earn a majority of U.S. business income, range in size and complexity, and operate economy-wide in a variety of industries, they represent unusual challenges to tax reform. Both the Trump administration and the 2016 House Republican tax reform plan propose large reductions in taxes paid on business income, including taxes paid by owners of pass-through businesses. For instance, the Trump tax plan proposes reducing the corporate tax rate from 35 percent to 15 percent and the top tax rate on income earned from pass-through business from 39.6 percent to 15 percent. Click on each fact to jump to its discussion. Of the 26 million businesses in 2014, 95 percent were pass-throughs, while only 5 percent were C-corporations. Almost all businesses are small. In 2014, almost 99 percent of businesses, whether pass-through businesses or C-corporations, had $10 million or less in sales or receipts. Pass-throughs are not necessarily small businesses. A small number of large businesses account for the majority of pass-through profits and economic activity. Pass through businesses now earn a majority of business income. In the early 1980s, C-corporations produced almost all business income. In 2013, only 44 percent of the income of business owners was earned through C-corporations. Pass-through businesses pay lower tax rates than C-corporations. The gap between the lower tax rate on pass-throughs and the higher rates faced by C-corporations creates a major incentive for businesses to un-incorporate and to organize as pass-throughs. The multitude of business types encourages inefficient tax avoidance. With so many options to choose from when determining how to structure a business and whether to distribute business income as profits, wages, or capital gains, business owners have considerable incentive and ability to avoid tax. The growth of pass-through businesses has eroded corporate and payroll revenues. If the relative shares of pass-through and C-corporate activity were held at 1980 levels, the average tax rate on business income in 2011 would have produced at least $100 billion in additional revenue in 2011 alone. 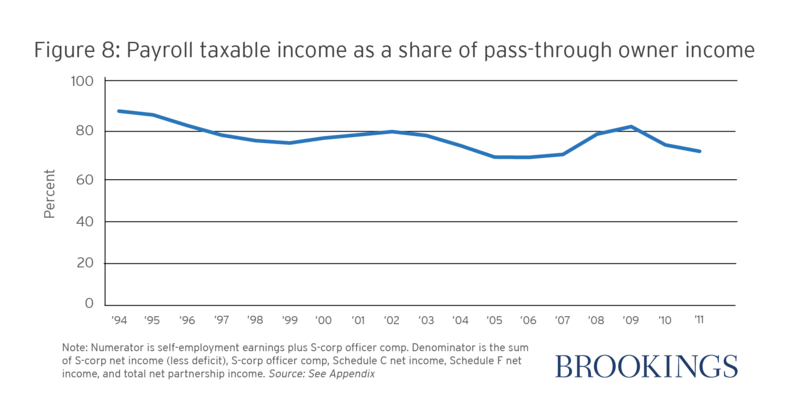 Pass-through income is primarily earned by high-income individuals. About 70 percent of partnership income accrues to the top 1 percent, compared to less than 50 percent of corporate dividends and 11 percent of wages. 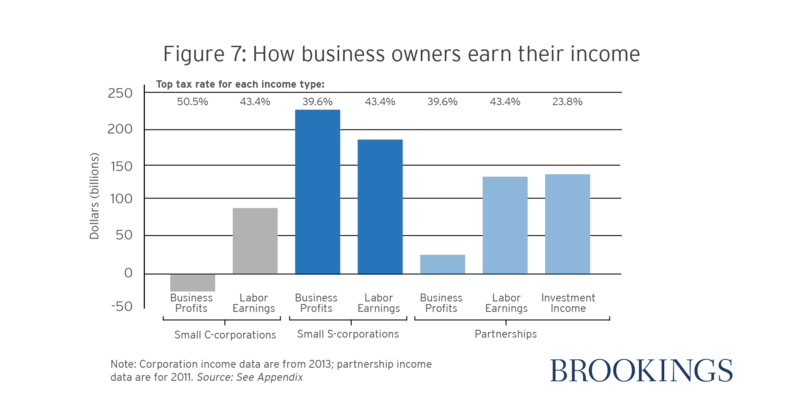 Pass-through businesses are responsible for a significant share of the tax gap. About 41 percent of the tax gap from 2008-2010, or $190 billion, was due to pass-throughs underreporting income and thus paying too little income tax. Fact 1: Most businesses are pass-throughs. Of the 26 million businesses in 2014, 95 percent were pass-throughs, while only 5 percent were C-corporations (Figure 1).1 C-corporations, which include most publicly traded businesses, pay taxes at the corporate level. As a result, the income of C-corporations is potentially taxed twice: once at the corporate level (with a top tax rate of 35 percent) and again when the profits are distributed to shareholders via dividends or capital gains (at rates up to 23.8 percent). Organizing as a C-corporation affords the owner limited liability (that is, the owner’s personal assets are protected against business losses) and facilitates complex financing such as selling shares to the public. In contrast, “pass-throughs” do not pay the corporate tax. Instead, their profits are “passed through” to their owners’ individual tax returns and taxed at the individual rate. Sole proprietorships are the most common type of pass-through business and represented 43 percent of pass-throughs and 41 percent of all businesses. These companies are operated by a single taxpayer in a wide range of businesses, ranging from babysitters and housekeepers, ride-sharing drivers, construction or handyman services, and even some doctors and lawyers. Because sole proprietorships enjoy fewer legal protections than incorporated businesses and are owned by a single taxpayer, they tend to be relatively small. The net income of sole proprietors is subject both to individual income tax and also to payroll taxes under the Self Employment Contributions Act (SECA). S-corporations file a corporate tax return and are generally subject to the same legal protections as C-corporations, but their income is passed-through pro-rata to its shareholders. In contrast to C-corporations or partnerships, the number of S-corporation shareholders is limited, there may only be one class of stock, and shareholders must generally be U.S. individuals (i.e. not tax-exempt organizations or retirement accounts, other corporations, or partnerships). S-corporation income is not subject to SECA, but owners who provide services to the corporation are required to pay themselves “reasonable compensation” in wages, which are subject to payroll taxes. While they are not “pass-throughs,” many closely-held C corporations in which the owners are also managers share certain similarities with pass-throughs and, in practice, the income of their owners is often taxed much like that of sole proprietors. Owner/managers of closely-held C corporations often pay themselves wages, which are deductible from corporate-level tax, in lieu of dividends, which are not. This way, they maintain the limited liability and legal benefits of incorporation, but avoid the two levels of corporate tax by receiving their income as wages. As a result, the taxes they face are more similar to general partners or sole proprietors than to, say, publicly-traded C corporations. Fact 2: Almost all businesses are small. The vast majority of U.S. businesses are small, whether they are pass-through businesses or C-corporations. Figure 2 shows the share of businesses with $10 million in receipts by type of business. Receipts generally mean sales, but can include income from legal services, rent received, or portfolio income of a financial firm. In 2014, almost 99 percent of all businesses were “small” by this standard (Figure 2).4 Almost every sole proprietorship was a small business; but 95 percent of C-Corporations were small as well. Whether a business is a pass-through partnership or an S-corporation, or whether it is a C-corporation is not a good indicator for the size, complexity, or even number of shareholders of a business. Fact 3: Pass-through businesses are not necessarily small businesses. While most businesses are small, the majority of economic activity occurs in large businesses—including large pass-throughs. In 2014, almost 83 percent of all sales and 81 percent of profits accrued to businesses with more than $10 million in total receipts, even though those businesses only represented 1 percent of all firms (Figure 2, Figure 3).5 Large businesses are responsible for nearly all of the sales and profits of C-Corporations, and a substantial majority of sales and profits of partnerships and S-corporations. Among sole proprietorships, in contrast, only 9 percent of sales and less than 1 percent of profits came from large businesses. Most hedge funds, private equity funds, law, consulting, and accounting firms are partnerships; these businesses can be large, global enterprises. Indeed, in 2014, about a quarter of partnership business income was earned in finance, real estate, and holding companies sectors, and about 13 percent by law firms. With the advent of publicly-traded partnerships, a few pass-throughs are now owned by thousands of shareholders and trade on stock exchanges like public C-corporations. Similarly, large S-corporations compete directly with large C-corporations in industries like engineering and construction, trade, and professional services. As a result of this concentration in activity and profits, the economic, revenue, and distributional effects of changes in business tax rates stem largely from how they affect large firms. Fact 4: Pass through businesses now earn a majority of business income. In the early 1980s, C-corporations produced almost all business income.6 In 2013, only 44 percent of the income of business owners was earned through C-corporations.7 Owners of S-corporations and partnerships now earn about half of all income from businesses. The shift occurred because of tax and legal changes that benefitted pass-through business owners and made pass-through form more attractive. For instance, in 1986, the top individual income tax rate fell below the corporate tax rate. This created significant incentives for a business to un-incorporate and for new businesses to organize as pass-throughs. The limits on the number of S-corporation shareholders was increased in steps from 15 in 1980 to 100 shareholders today—and up to six generations of family members are now treated as one shareholder. Legislation loosened limitations on the activities, financial structures, and shareholders of S-corporations. For partnerships, changes in state law established new entity types, like limited liability companies (LLCs), and regulatory changes, like the “check the box” rules finalized in 1996, allowed a multitude of business types to elect to be taxed as partnerships (just by checking a box). More recently, the implementation of the Medicare surcharge and the Net Investment Income Tax, which carved out S-corporation profits from either tax, increased the relative benefit of earning income through an S-corporation. Fact 5: Pass-through businesses pay lower tax rates than C-corporations. Corporate income is often taxed twice: once at the entity level with a top marginal rate of 35 percent, and again on the individual level when profits are distributed to shareholders as dividends (with a top rate of 23.8 percent). For taxable shareholders, this produces a combined maximum marginal rate of greater than 50 percent (Figure 5). More than 75 percent of corporate shareholders, however, are exempt from U.S. shareholder-level taxes because they are either tax exempt organizations like university endowments or retirement and pension funds, or are foreign shareholders, who generally are not liable for those taxes.8 For those shareholders, the only tax they face is the corporate-level tax. The statutory tax rate on pass-through owners is lower. General partners in partnerships face a top tax rate of 43.4 percent (39.6 percent under the income tax plus the 3.8 percent Medicare payroll tax). In addition, a large share of the income of partnerships is portfolio income—long term capital gains—which is taxed at a top rate of 23.8 percent. While much of the capital gain income flowing through partnerships is simply a return on limited partners’ capital investments, some portion represents the ‘carried interest’ that general partners receive in compensation for their investment services. S-corporations face the lowest top rate on their business income—39.6 percent—because S-corporation profits are not subject to neither the payroll tax rate on earned income nor the Net Investment Income Tax that generally applies to investment income. Of course, not all business owners face the top bracket rate and, even if they do, they may benefit from other deductions, credits, and exemptions, which reduces the tax they pay; and some of their shareholders may be tax exempt. Figure 5 shows that even after taking these factors into account, the average effective tax rate on corporate income (about 32 percent) is still substantially above the effective rates paid by pass-through businesses.9 In contrast, the effective tax rate on sole proprietorships is about 14 percent, roughly 16 percent for partnerships, and 25 percent for S-corporations. (The rate on professional service and healthcare partnerships, where the vast majority of income is ordinary business income rather than capital gains, was about 22 percent.) This gap between the tax rate on pass-throughs and C-corporation creates a major incentive for businesses to un-incorporate and organize as pass-throughs and is a driving force in the relative growth of the pass-through sector. Finally, the top statutory rates and average effective rates mask substantial differences in what individual business owners pay in taxes. Most businesses are small, earn relatively modest income, and thus face relatively low bracket rates. As a result, more than 85 percent of pass-through businesses in 2014 faced a top rate of 25 percent or less; only 3 percent faced a marginal rate greater than 30 percent (Figure 6).10 However, a much larger share of pass-through income does face high marginal income tax rates. Almost half of pass-through income in 2014 came from businesses with a top rate of at least 35 percent. In other words, a small number of large pass-throughs are responsible for the vast majority of the sector’s tax burden. Fact 6: The multitude of business types encourages inefficient tax avoidance. It’s no surprise that business owners seek to minimize the taxes they owe. The array of different business entities to choose from and the flexibility in determining whether business owners income is distributed as profits, wages, or capital gains provides considerable opportunities to structure a business to reduce tax. Because each of these sources of income may be taxed at different rates, business owners spend considerable time and cost in efforts to structure their activities to minimize taxes. Figure 7 provides one dimension of how these distortions affect how income is distributed to owners. Owners of small C-corporations (those with less than $10 million in receipts) tend to take all of their income in the form of labor earnings (specifically, officer compensation), which is deductible to the firm, reducing their corporate income close to zero. Because wages are taxed at a top rate of about 43.4 percent, the resulting tax bill is substantially lower than the 50.5 percent rate they would face if they first payed the corporate tax and then paid individual tax on the dividends. Owners of S-corporations, in contrast, face the opposite incentive. While wages are taxed at a rate of 43.4 percent, the top rate on profits is thus 39.6 percent. In practice, about 55 percent of S-corp owners’ income is distributed as profits and only 45 percent as labor earnings. While “reasonable compensation” rules apply to both C-corporation and S-corporation owner-managers, this pattern suggests they are not working; the incentive to reduce taxes results in substantially different patterns of compensation and profit-making. In partnerships, the rules are different—all general partnerships (GPs) are supposed to pay self-employment taxes—but a growing number of partners are not GPs for tax purposes, including LPs and many LLC owners. While it is difficult to estimate how much partnership income avoids payroll tax, roughly 9 percent of total net partnership income distributed to individual partners in 2011 appeared to avoid SECA (and was thus taxed only as business profits). Even among partners with positive, non-passive partnership income (i.e. excluding portfolio and passive income), about 20 percent of distributed profits appear to avoid SECA taxes.11 About 45 percent of total partnership income was taxable as labor earnings under SECA. In addition, a large share of partnership income is portfolio income (mostly capital gains and dividends) which are taxed at substantially lower rates. General partners in real estate or financial firms who provide management services to investors generally take a portion of their income in the form of portfolio income—“carried interest”—rather than salary, to minimize taxes. The effort, cost, and complexity of structuring businesses and business activities to minimize taxes is inefficient and wasteful. 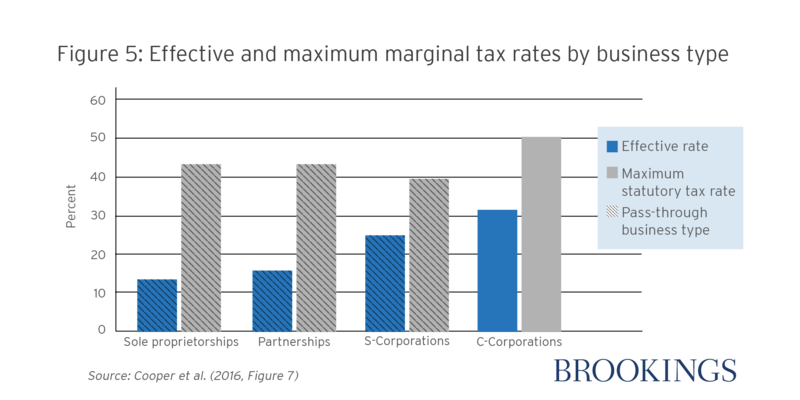 Proposals that create larger differences between the tax rates faced by corporations and pass-throughs, or wages and business income, are likely to exacerbate these problems further. Fact 7: The growth in pass-throughs has eroded corporate and payroll revenues. The growth of pass-through businesses has also contributed to the erosion of the payroll tax base, which funds the Social Security, Disability, and Medicare trust funds. Prior to the mid-1980s, owners of closely-held businesses paid Social Security and Medicare payroll taxes on most of their income. Most businesses were either sole proprietorships or general partnerships (in which all business income is treated like wages for payroll tax purposes) or closely held C-corporations (whose owners generally paid out their income as wages to avoid the double tax on profits). The growing share of income accruing to limited partners, LLCs, and others that file as partnerships and to S-corporations eroded the payroll tax base because those entities are either statutorily excluded from the payroll base or a lack of clarity in the law allows owners to avoid the tax.13 In 2011, about 71 percent of pass-through owner income was subject to Social Security or Medicare taxes; in 1994, the share was greater than 88 percent (Figure 8). 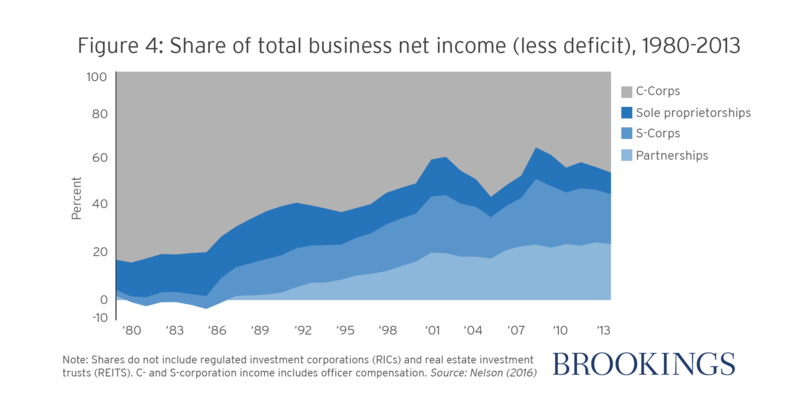 In addition, pass-through business income has increased over time as a share of total income. As a result, these shifts have eroded the long-run solvency of the trust funds that depend on payroll revenues. Fact 8: Pass-through income is primarily earned by high-income individuals. An overwhelming share of pass-through income is earned by those at the very top of the income scale. In fact, about 70 percent of partnership income accrues to the top 1 percent, compared to 44 percent of corporate dividends (Figure 9).14 Individuals in the bottom 80 percent earn virtually no pass-through income.15 Moreover, those with higher incomes tend to receive a much greater share of their income from business compared to those with lower incomes, as the top 1 percent only earn about 11 percent of wage and salary income.16 Thus, any reductions cuts in the tax rate on pass-through businesses would largely benefit high-income taxpayers. Fact 9. 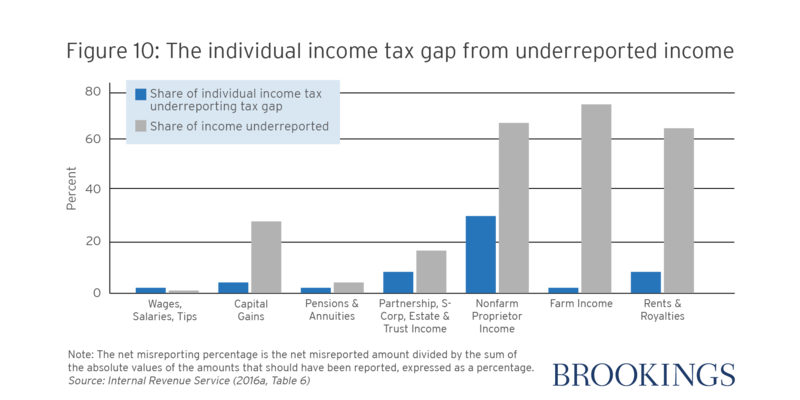 Pass-through businesses are responsible for a significant share of the tax gap. Prisinzano et al. (2016). Businesses are defined as taxpayers who meet the de minimis test (total income or deductions exceed $10,000 or their sum exceeds $15,000) and the business activity test (total deductions exceed $5,000). If a corporation is a partner, the share of income dedicated toward the corporation is taxed on the corporate level. Treasury Office of Tax Analysis 2016. Prisinzano et al. (2016). Alternative thresholds for size of business produce similar results. Shares do not include regulated investment corporations (RICs) and real estate investment trusts (REITS). IRS Public Use Microdata files 2007-2011; DeCarlo, Lee, and Shumofsky (2013); Werfel et al. (2014). Office of Tax Analysis (2016). IRS 2011 Public Use File. The net misreporting percentage is the net misreported amount divided by the sum of the absolute values of the amounts that should have been reported, expressed as a percentage (Internal Revenue Service 2016a).